Asociación Galega de linfedema, lipedema, insuficiencia venosa crónica y otras patologías: INTERNATIONAL AWARENESS CAMPAIGN TO PROMOTE CORRECT TREATMENT FOR LYMPHEDEMA / CAUTION FOR VERY SERIOUS SIDE EFFECTS PRODUCED BY MODIFIED ECONOMMICAL VERSIONS OF TREATMENT. 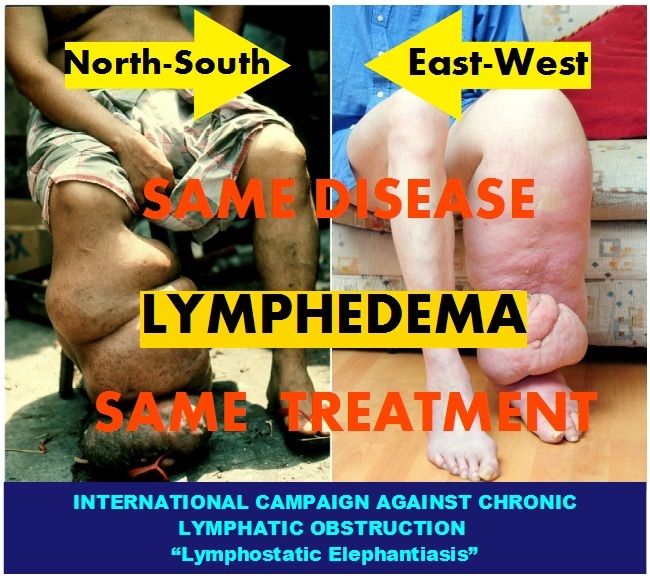 INTERNATIONAL AWARENESS CAMPAIGN TO PROMOTE CORRECT TREATMENT FOR LYMPHEDEMA / CAUTION FOR VERY SERIOUS SIDE EFFECTS PRODUCED BY MODIFIED ECONOMMICAL VERSIONS OF TREATMENT. Around the world there are millions of people suffering from lymphatic disorders, and not only due to filariasis. Early identification and treatment may prevent the condition from progressing and this can improve quality of life. All Lymphedema equally need specialized therapy CDT (Complete Decongestive Therapy), the only treatment that safely reduces and maintains this chronic disease. Caution must be taken with new modified and simple versions of treatment for Lymphedema, they are more econommical, but can have very serious side effects.(see:http://www.linfedemagalicia.com/2017/05/beware-with-new-modified-terminology_14.html). Lymphedema is a serious condition that often causes pain and disability, and can predispose patients to life-threatening complications.Without treatment, the condition progresses to states of great disfigurement known as elephantiasis. Due to that the lymphatic system is not working optimally, patients are more susceptible to infections which can develop into cellulitis, a potentially serious bacterial skin infection or even an irreversible sepsis. Long-standing lymphedema without treatment, has more risks of developing Sepsis and Linfangiosarcoma. Every person suffering from lymphoedema, whatever its cause or setting, needs good specialized treatment and compression garments to stabilize the disease.